As a member of the Schoolhouse Review Crew we were sent a Computer Science course from Computer Science For Kids. We reviewed the Beginning Microsoft Small Basic. Also we were sent the Computer Bible Games for Microsoft Small Basic as an opportunity to review as well. 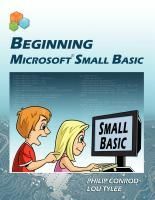 For the purpose of this review I will share only what Michelle(15) reviewed which was the Beginning Microsoft Small Basic. I chose Michelle to work on this review because it was very timely as she had just requested if she could learn more about computer programming. Beginning Microsoft Small Basic is a computer programming course that teaches the basics of computer programming codes and language. The course is divided by 11 chapters, each chapter is intended to be completed in one week. There is no prior computer programming experience needed to begin this course! Which I was happy to find out because I have none:) You can go here to find out what the computer system requirements are. This course is available in many different purchase options. You can purchase it as a download, or a physical book. We received the instant internet ebook download edition for a single user, the cost for this option is $59.95, it is on sale right now for just $34.95. After receiving the download links, I printed off the first 5 chapters for Michelle to use. It was most helpful this way for her so that she didn't get bogged down looking at two different computer screens at the same time. Once this was done Michelle was pretty much on her own to navigate the program and begin her independent study of computer programming. The first lesson really got her engaged in learning about the history of computers. One of the things that she commented about was how she loved the author's style of writing. It surprised her that it was written in a lively way. Michelle had a preconceived notion that learning the codes of programming would be boring and to the point, just letters and numbers. Which was one of the reasons that delayed her interest in the world of computer programming. When it got time to learning the codes and playing the games I haven't seen her off of the computer since. Michelle has made it through seven chapters during the review period and if life was just about computer programming I am sure she would have completed it all the way. DJ and Ken have also had a blast and can't wait to get their turn to participant in this independent study of computer programming since they have watched alongside Michelle coding games. Some of the things I like about this course is that it can be done independently, each lesson builds on the previous lesson, and the program promotes self correcting. As soon as I can I will also start to do this course myself too, I'll be sure to update you all when that time comes. You can find a chapter sample of this course here.